I came across this recipe in the wilds of Nevada about 20 years ago, when I was snowed in, leafing through my host’s stash of ancient Gourmet magazines for the most warming dishes. Heat the oil in a flameproof casserole and brown the lamb well all over. Remove the lamb and set it aside. Add the onion to the pan and cook until soft and golden, then add the garlic and chillies and cook for 2 minutes. Add the cumin and cook for another minute. Return the lamb to the pot along with the tomatoes, lager, tomato purée, sugar, oregano and lamb, season well and bring to the boil. Immediately reduce the heat to a very gentle simmer and cook – uncovered – for 1 ½–2 hours or until the lamb is completely tender. Stir in the beans halfway through. Taste, add the lime juice, spring onions and fresh coriander, stir and taste again. Adjust the seasoning. Serve with soured cream or Greek yogurt, avocado slices and grated cheese. 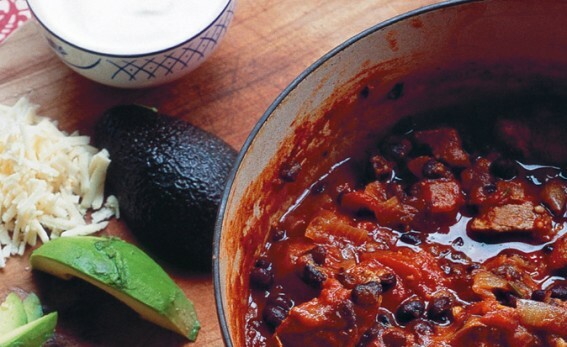 Sausage and black bean chilli Make as above but, instead of lamb, use sausages – lamb, pork or venison – and cook for 1 hour. Turkish black-eyed peas with spicy sausage Heat 2 tbsp olive oil in a flameproof casserole and fry 1 onion, roughly chopped, and 400g (14oz) spicy lamb sausage, cut into chunks. When these are golden, add 4 garlic cloves, chopped, 1 red chilli, deseeded and chopped,½ tsp each ground cinnamon and allspice and 2 tsp cumin. Cook for 2 minutes, then add a 400g can chopped tomatoes in thick juice, a 400g can black-eyed peas (drained and rinsed), 250ml (8fl oz) stock or water and seasoning. Stir in 2 tbsp chopped flat leaf parsley, ¼ tbsp dried oregano and 2 tsp soft light brown sugar. Bring to the boil, reduce the heat and simmer for 35 minutes until thick. Check the seasoning (you may want more sugar or chilli), stir in more parsley and serve with rice or bulgur wheat. Serves 4.